I love the Book of Matthew. It is my favourite among the Gospels, probably because it contains many of the teachings of Jesus. Of course, a teacher like me will feel right at home with a book like that. I also love the fact that Matthew strived more than the other Gospel writers to show that the birth of Jesus and the things He said and did in the course of His ministry were a fulfilment of prophecy. There are many passages of Jesus’ teachings in Matthew and one that covers three long chapters (5-7), called the Sermon on the Mount, contains many of His popular declarations like the Beatitudes. In them, He shows the true meaning of blessedness and follows that up with the role of the believer in a decaying and darkened world. Our focus here will be on the latter. The analogy the Lord draws is apt. In a world darkened by the corruption of sin, the believer is to be a light. In a world befuddled by the chaos and confusion that rebellion to divine order spawns, the believer is to be a spiritual and moral compass showing people the way. But many a believer seems just as lost as the rest of the world. Many believers seem to be groping in the darkness unable to find their own way much less guide others. Or they seem to be leading their followers into a ditch because the light of God in them is covered. So what are some of the things that can cover a believer’s light? 1. Neglect of the word of God: Many Christians have not developed the discipline of reading and studying their Bible constantly. No wonder they seem to be leaving the road to wander around in the bush. We need to form the habit of reading our Bible through once every year, the entire Bible, not just the parts we choose. When we do this in a devotional manner (i.e. under the guidance of the Holy Spirit), it changes our perception and helps us to see things more clearly. “When thou goest, it shall lead thee; when thou sleepest, it shall keep thee; and when thou awakest, it shall talk with thee. For the commandment is a lamp; and the law is light; and reproofs of instruction are the way of life” – Proverbs 6:22 & 23. 2. Seeking worldly approval: Many believers are yet to have the truth that we are in the world but we are not of the world, as the Lord Jesus affirmed in John 17:14-16, fully sink into them. They are struggling to please the world and live according to its standards. This is a violation of the word of God and steeps us in the very darkness we are to shine our light on. Historically, the desire to fit in was the bane of the children of Israel. God gave stiff warnings about this but the attraction of being like others prevailed and they ended up in captivity. While we cannot avoid unbelievers as long as we are in the world, it is unwise to make them our best friends and aspire to please them more than God. 3. Fear of persecution: Believers sometimes hide their light to “protect” themselves. We may fear standing out because it exposes us to ridicule and persecution but that is part of what it means to be a child of God in a world where evil predominates. However, the Lord Jesus promises to be with us through it all. So next time, someone castigates or threatens to punish you for holding Biblical views, don’t apologise but respond like the apostles when the Jews warned them to desist from preaching in the name of Jesus. I feel like high-fiving these brothers and shouting, “Way to go!” May God grant us the courage to do like them always in Jesus’ name. The scriptures used in this post are from the King James Version of the Bible except where otherwise stated. This post has juiced my morning. Thank you very much, ma. Indeed our light as Christians should not be hidden under a bushel. AS we meditate day and night on the word of God, not only is our faith strengthened but we are transformed even as our minds are renewed. But to be honest, it requires the grace of God for us to stand-fast. One thing that has kept some Christians is an encounter. That's what affirms what the apostles said. The boldness was not like men because they had physical encounter with Him. this, no one could ever take away. I pray for an encounter that will cause a radical transformation in our lives as Christians that will make us fearless in all situations and challenges, preaching the gospel and carrying out other duties as Christians. Amen Shalom. Your comment is simply wonderful, Kingston! I say "Amen" to your prayer in Jesus' name. You will surely go places in Jesus' name. Amen and amen! Thank you ma. Amen. Thank you for that prayer, Rita! You are highly blessed in Jesus' name. It's true that most Christians do not find time to read their Bible. I don't really know why it's like that, may be because we have not made up our mind to do so. I like this part where you wrote we are in the world but we are not of the world. It is only when we fully believe in our Lord Jesus Christ that we can understand what that sentence really means. Thanks aunty. God, help me to follow the right path. Let your light so shine...... this keeps me going as a christian, having in mind that my heavenly father must be glorified through my deeds on earth. the gospel of Christ/evangelism is not restricted to going around with our bibles to preach the word of God, our character as Christians can go a long way to bring glory to God. 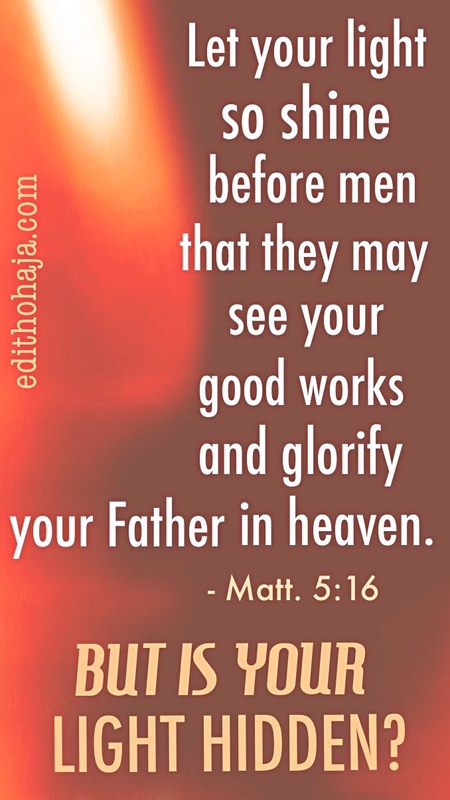 i pray that our lights will continually shine before men that they will see our good deeds and glorify our father in heaven. Amen. Talk is cheap, as they say. Anyone can claim anything but the Bible says that by their fruits, you shall know them. Bless you, Merit! I can't agree more, my dear! May God keep us focussed on our compass in Jesus' name. Glad to have you here, Ifeoma! May the Lord help us to withstand the pressures of this age and stand for Him in Jesus' name. These three things are what we are, when we do not fully realise, as christians, what privilege we truly have. We have the capacity to illuminate the world and make it free from darkness because we have as our source of light- Christ, the Savior. I know it may seem hard to be in the world and not of the world but, if any one christian did it, we all could do it if we tried. Honestly, it would be an eternal shame if, as a Christian, and in the end, one cannot account for their good use of light. God help us to be good users of his divine light, AMEN! A big "Amen" to your lovely prayer. Thank you so much, Chioma! You are blessed! Thank you, Florence. That was a long one, lol! You are blessed! what a powerful message! keep blazing the trail ma. Yours is a legacy to be emulated. well done. Wow! Oga James, thanks for dropping in. All glory to God! So true......... studing the word on a daily basis'll help broaden one's idea about God's plan for him/her. Yes, it will, among other things. Bless you, my dear! True, and be able to direct others to God. This piece is replete with lessons that are worth imbibing. Personally, i have always striven to lead a pattern of life that will redound to the praise and glory of God. we already have the holy bible as our compass. it is always there to direct us in the way we should go. Praise God! Thank you, Gideon, and remain blessed! Glory to God and God bless you too, my dear! First of all aunty Edith this one you feel like high fiving the apostles, you have mind o so you can now teleport to the past hmm...am scared o. On a serious note though the piece was nice. I love the part of not fearing persecution. Sometimes I am scared to speak the word because I don't want to be branded "churchious". My favourite apostle is john, simply because he is a sharp guy by declaring himself " john the beloved". I love the fact that he considers himself to be the most loved by Jesus Christ. So from now on I too am ononso the beloved. Lol, Ononso! No teleporting in time oh! I meant if I was there... If you are more beloved than you are already, you will be spolit and we can't allow that, can we? This is wonderful and it's not a joking matter oh, Ononso! God will help you if you mean it and it will make a great positive change in your life. Grace to you in Jesus' name. The word of God in my system is everything I need to bring out the best in me. My light shall never be covered. God bless you ma. Amen. And may God bless you much more, my dear! Will do but you need to fully decide to walk with God so that.His grace poured on you will not be wasted. Mathew Mathew Mathew.. Neva knew it has such interesting chapters and teachings! !...tnks Edith for showing me more of Dis!! Ur posts have bin a source of hope and inspiration to me... Kip up wit da gud job...it's 1daful. Glory to God! Bless you, Onyeka! This is a nice piece ma, and very true. Many believers' lights have been covered because of fear of persecution, they struggle to seek wordly approval and they neglect the word of God and their quiet time. As Christians we should shine our lights so bright that the world will see. And join us to serve the Lord. Amen in Jesus' name. Good day MA,yes I agree with our post as Christians our light need to shine so the world will see it and we cannot do that by just living without Christ in us.We need to engage in moral activities that can help build our lives.So our lives will shine before men. We need to give our lives to Christ and let His Spirit direct and teach us in the way of righteousness. God bless you richly in Jesus' name. judging from HISTORICAL perspective the development of Media in the World.during the early beginning of writing,literature pieces was highly appreciated,but it was unfortunate that were era of technology where writing texts are no longer acceptable by the youth which resulted in decline in reading books.So BIBLE is not left out. however, I like the post. thanks. But people can read e-versions of their Bibles. Technology makes it easier to read for those who wish to. Cheers! It's true some parts of the Bible are couched in symbols but most of it is in easy-to-understand story form. You are right, we need the Holy Spirit to help us interpret. We can also use contemporary versions and study tools like Bible handbooks, study Bibles, Sunday School manuals, devotional guides, etc. But whatever we do, we should do it prayerfully and not read carelessly like any common book. Really believers should avoid whatever prevents their light from shining.......but the glaring truth is that grace must be on our side to do this. I like this part; it is better to shine your light than cover it and incur God's wrath. Bless you ma for this. Praise God you were blessed by the message. You are blessed, my dear! Tank u ma DAT is where our test as a good Christian comes to play, I love dis post ma the place of d holy spirit in d life of a Christian makes d difference. Christianity over the years has been weakened because of the fear of the unknown--fear of being persecuted, rejected and being misunderstood--at the expense of us standing as God's ambassadors to earth. There are so many things I see around me that are absolutely wrong but to speak against it takes a lot of thinking. It is wrong. I ought not to tolerate sin or evil of any kind. I must take a stand. There is no space for neutrals, God dislikes it. My prayer is that God helps us (me) to shine our (my) light no matter the circumstance. Thanks, Aunt Edith, I'm encouraged. I say "Amen" to your prayers, Elizabeth. You are blessed! His word keeps us from the world, his word preserves us in persecution, his word makes the difference in us, his word is the essence of our lives and existence. I pray that we shall know more of him, his will for us all by his word. I pray we shall stand alone for him even when others think it a foolish thing to do, I pray we shall serve him without compromise of any kind. I pray our lights shall be uncovered by sin and all unfruitful works of darkness in Jesus Name. Bless You ma for this reminder. Amen and Amen. Thank you so much, Obinna. You are lifted in Jesus' name. My day has been blessed and graced by these posts. D Lack of God's word, seeking of man's approval and D fear of Persecution are d three things. I have noted these and I must earnestly fight them in my life starting from today. Thank u ma. I love dis. Praise God! In the power of the Lord, victory is yours already in Jesus' name. My dear, that's what the illustration is addressing. This is really true. These 3 things are the major things I think can cover a believer's light, when we neglect the word of God, seek wordly approval and fear persecution, we are probably walking towards our doom and hiding the light of what God truly made us to be. I agree with Kingston's comment.. We as Christians need to keep our light always flaming and to do this, we need the grace of God in our life.. Ma this is a wonderful piece. Also looking at your posts, you have always tried to show the importance of the grace of God in people's life... I was not confused when I said you are an inspiration to your generation and the younger generation.. God bless you. .
That's where our test as good Christian cms to play. Pray that God hps us shine our light no matter d situation. This was quite enlightening. Your write up has been so inspiring and for that I'm grateful! Im so inspired. Thank you for sharing with us, Ma. First and foremost, we don't read our Bible and that's where our problems start. Secondly, those who read, most times misinterpret the context thereby misleading others. Ma, just as you pointed out, we often neglect the word of God due to earthly desires. Due to fear of being persecuted, we do not share the word of God or minister to others to understand better. Thank you ma for always inspiring and sharing the word of God with us. 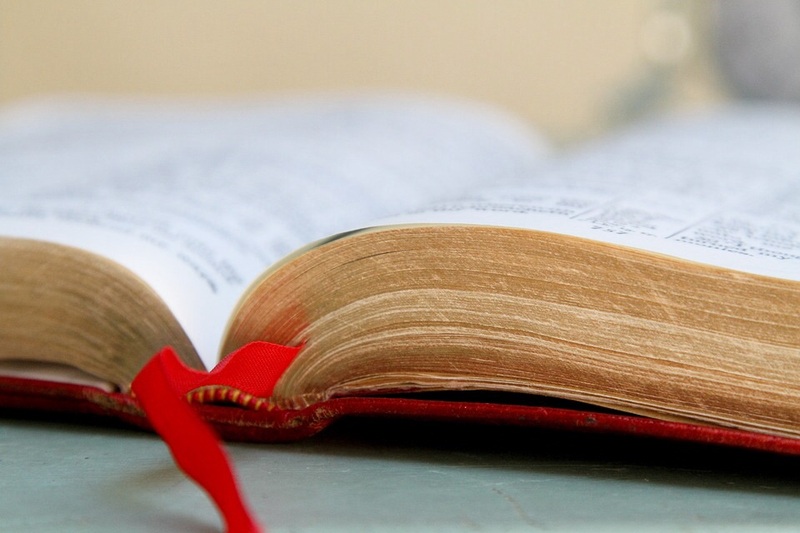 The major problem most Christians face is the lack of quality time with the word of God. But I pray God to help us change that attitude. In Jesus name I pray, Amen. well done ma'am 4 that inspiring one. that was a clarion call for anyone who calls himself/herself a Christian to get acquainted with the Scriptures. God has called us out of darkness into his marvelous light,we must strive to remain in constant relationship with him. So many things could dim the light in the life of a believer. we are hereby advised to steer clear from this possible factors. Nice work ma. Auntie Edith, I'm wondering where you teach? Are you in Nigeria? I traveled to Lagos several times when my husband and I were missionaries living in South Africa. Our sister church in Lagos was one of my favorites to visit. Thank you for this reminder to let our light shine and not allow it to be covered up. Our world needs our light! Yes, I am in Nigeria. Thanks for dropping by, Lori. God's overflowing grace and goodness upon you and your family in Jesus' name. Much wonderful wisdom here. Thank you. I find that "loving people" sneaks in, and hides innocently behind, "desire to please," and BECOMES a problem when it takes our focus off of the relationship with the Lord. God FIRST.... easier said than done. So grateful for His word, and encouragement from the family, such as here! Thank you for this post. I have been thinking about this very topic, recently. I have wondered why I go through different seasons and my light does not seem to be as bright. I love your challenge of reading through the Bible in a year. I've always wanted to do that, but have never gotten through it. I agree that we live in a world where people are afraid to speak up for God; may we be so radically changed by the Gospel that we can't help but to let our words of light and life flow in response. Amen! Thank you very much for your heartfelt response, Christina! May God help us to his ambassadors indeed on earth in Jesus' name. So true, I especially like neglect of the word. As soon as we begin to neglect time with God, we start to lose our light. This is a great reminder that as Christians we should not conform to the things of this world but rather we should diligently seek God in all things and put him first in every thing we do. And also we should be dwellers of his word and not dippers because we can only be able to shine as light which he has called us forth, to be only if we dwell with him through trials and tribulations, because he has already made it known that he will be with us through all things. Most times, its not easy to shine our light in this wicked world without the fear of oppressions but with the word of God in our heart, our light must shine, in Jesus name. This is to bring to our notice that we shouldn't cling to the things of the world but dilligently look up to God for His own things. Neglecting the word of God is one tin that can end a man journey when he is still on the journey, God's word is a light onto our part, with God Word we can overcome any challenges and be victorious. That why he told us in book of Matthew to seek first is kingdom before anything. These three things summarizes all in a Christian life and if He/She works on them, no bushel can cover his light. Bless you. The #3 is one part that limit most christians. We don't like persecution, avoiding it with all vigour. Christianity is not rock n roll, persecutions makes us stronger but we fear the stigma it would bring. We see been at peace with all men, entails running from persecution which will mar relationship but it isn't. This is a reminder that our light should so shine irrespective of where we are in this world.I pray for more of God's grace to help us find this light and show it to the world. The things you pointed out are very true and we can see them manifest in today's world, most especially seeking worldly approval. At times we cant help but tend to please the world with our deeds and actions even when we clearly know they violate God' word. Again, studying the bible to have a better understanding of God's word is a necessity for any up and doing christian. May God help us keep walking in his light!! DEAR AMERICAN BELIEVER, DO NOT WASTE YOUR INDIAN SUMMER!